This English Language Arts unit explores several types of verbs including action, helping, linking, irregular, simple tense, and perfect tense verbs. This unit is intended for upper-elementary students that have some prior knowledge of action verbs. It consist of 9 lessons approximately 60 minutes in duration. An independent writing task, which may couple as an assessment task, is included in the unit. The number of lessons required to complete this task may vary from class to class. To identify action, helping, and linking verbs. To correctly use past, present, and future simple tense verbs. To review past, present, and future simple verb tenses and to introduce irregular verbs. To identify and effectively incorporate irregular verbs in written work. To write sentences with correct subject and verb agreement. To understand and identify the past perfect tense. To understand and identify the present perfect tense. To understand and identify the future perfect tense. To assess students' understanding of all types of verbs taught within the unit. This unit provides opportunities for cross-curricular integration, especially in writing. Be sure to review all lesson plans and resources prior to commencing the unit. Ensure that there is ample wall space for posters and charts used in this unit. 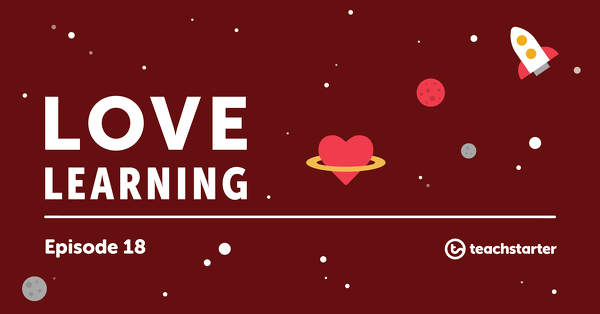 A 60 minute lesson in which students will identify action, helping, and linking verbs. A 60 minute lesson in which the students will learn about past, present, and future simple tense verbs. A 60 minute lesson designed to review past, present, and future simple verb tenses and to introduce irregular verbs. A 60 minute lesson in which students will identify and practice using irregular verbs. A 60 minute lesson in which students identify and practice subject-verb agreement. A 60 minute lesson in which students practice identifying the past perfect tense within a text. A 60 minute lesson in which students practice identifying the present perfect tense within a text. A 60 minute lesson in which students practice identifying the future perfect tense within a text. A comprehensive assessment to be given at the end of the unit to assess students' understanding of various types of verbs. A 26 slide PowerPoint presentation to use when teaching various types of verbs. 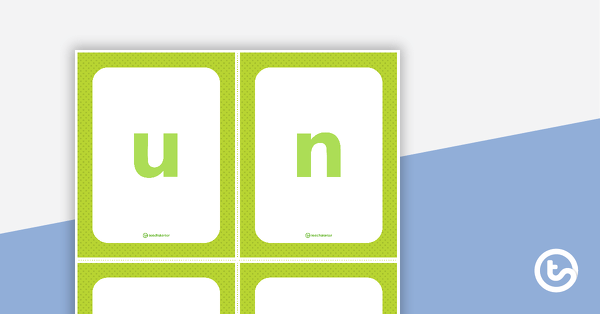 An active game that allows students to consolidate their understanding of action verbs. An exit ticket on action, helping, and linking verbs to use as a quick assessment. 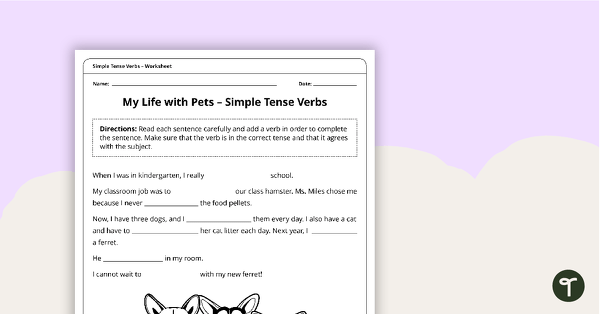 An ad-lib style worksheet where students can add their own simple past, present, and future tense verbs. A worksheet that helps students identify irregular verbs. An active relay race game in which students spell out irregular verbs. 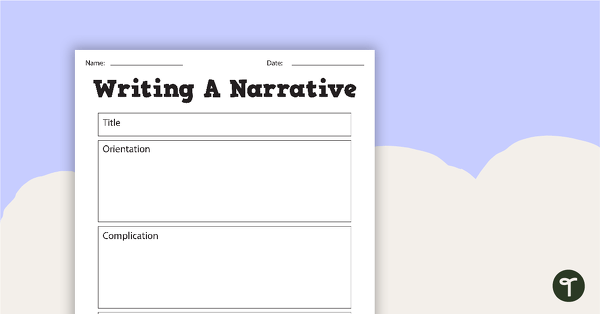 A narrative writing teaching pack containing 9 worksheets and posters. 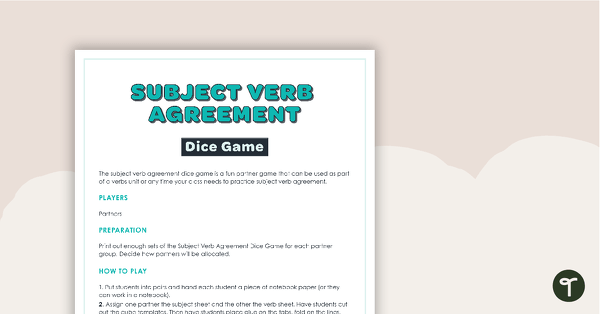 A dice game for pairs of students to help practice subject verb agreement and sentence writing. 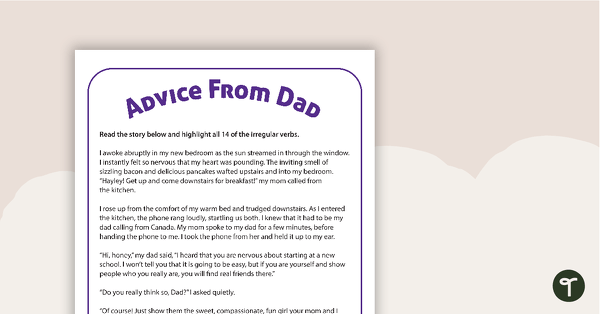 A series of three worksheets that contain passages written in the past, present, and future perfect tenses. 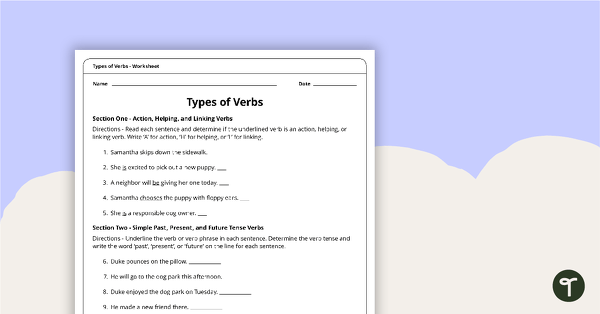 A worksheet that can be used to practice or assess students’ knowledge of various types of verbs. Form and use regular and irregular verbs.